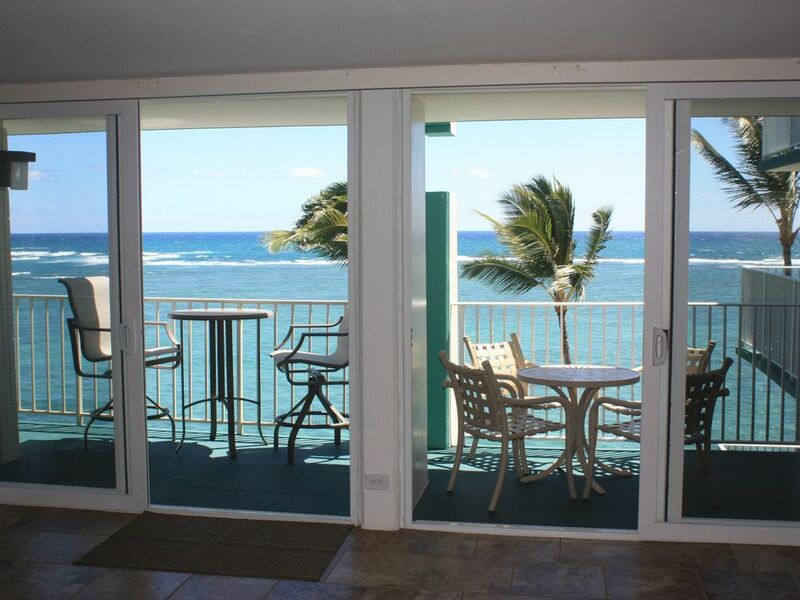 Enjoy the spectacular views from all four Lanai (Three with Ocean Views). Located on the Windward side of Oahu, this large 2 floor 2000 sq. ft. penthouse condominium offers everything you need for a memorable holiday. Enjoy a cool drink and relax watching the waves massage the shore and spot an occasional migrating whale on the horizon from the ocean-side lanais. Enjoy the fantastic views from every room. The 8th and 9th floor Penthouse has an open floor plan with spacious living area connecting the dining and kitchen areas. There are two second-floor bedrooms with ocean view lanai, both with full bathrooms. This location is great for children with a unique, reef-protected, beach area. Condo has a small collection of snorkel equipment and boogie board for your use. Enjoy the two, championship, golf courses at the nearby Turtle Bay Resort or a day at the Polynesian Cultural Center. You can even catch a 'big wave' at the nearby Sunset Beach. It is just a short drive to Kualoa Ranch for horseback riding and water activities.